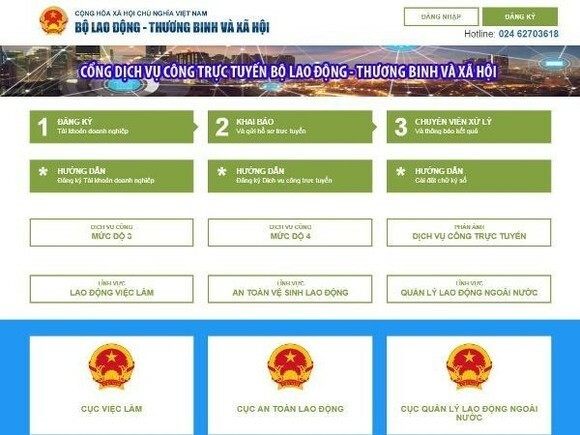 The Ministry of Labour, Invalids and Social Affairs (MoLISA) inaugurated its public services portal in Hanoi on November 23. It was part of efforts to realise the government’s resolutions on e-government, improving the business climate and national competitiveness, and business development till 2020. Speaking at the event, Deputy Prime Minister Vu Duc Dam said the portal covers the fields of education, health care, finance, environment and natural resources, labour, and social welfare. He asked the MoLISA to acquire public feedback to improve portal services and connect them with the national public services portal. On the occasion, he urged ministries and agencies to continue building public services portals as guided by the Ministry of Information and Communications. According to Minister of Labour, Invalids and Social Affairs Dao Ngoc Dung, the sector is providing more than 300 administrative procedures in service of the public and businesses, nearly 140 of which are at the central level. In 2016, the ministry asked for the government’s permission to launch five public services at the level 3 and 4 in the fields of overseas labour management, labour safety and employment. In overseas labour management, over 30,000 documents were processed in 2017 alone, or more than 90 percent of the total. About online public services relating to work permit granting for foreign workers, the ministry processed over 5,000 documents in 40 municipal and provincial departments. This year, the MoLISA is building nine online public services which will be connected with the portal. As scheduled, the portal will cover labour relations later this year and education-vocation by 2018 and other fields by 2019. At the same time, the portal will share data with ministries and agencies and connect with the national public services portal as directed by the government.